This is the culprit – one of the items in the Undressed: a Brief History of Underwear exhibition at the Victoria & Albert Museum. The signage tells us that it is a cuirass bodice dress in silk satin and lace, dating from 1876 and adds that it was considered shocking at the time because…. I thought it might be fun to look more closely at why it was so shocking. But first, I want to look at what a cuirass bodice actually was. According the The Oxford English Dictionary, a cuirass is a piece of medieval body-armour comprising a back-plate and breast-plate fastened together with buckles or in some other way. The important thing is that it is rigid. Cuirass corsets steam-moulded from The Milliner and Dressmaker, 1874. The 1870s cuirass corset was longer than the medieval cuirass and covered the hips as well and came down to a point at the front. It, too, was rigid. The material, usually linen, was stiffly starched and whale-boned before being steam-moulded over an earthenware or metal mould. The result was a rigid garment which made movement almost impossible; on the other hand, it fitted the body like a glove and gave it that desirable svelte curvaceous look. 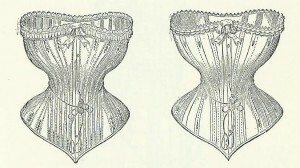 What is interesting, though, is that the cuirass corset, cumbersome though it was, was also seen as ‘an ever-present monitor indirectly bidding its wearer to exercise self-restraint; it is evidence of a well-disciplined mind and well-regulated feelings.’ Ingenious spin-doctoring is obviously not a modern phenomenon. The cuirass bodice day dress, 1875-7. So, back to the cuirass bodice dress. The example above is made from two materials, probably silk and velvet and the long bodice, which comes down over the hips, emphasises the cuirass effect. The sleeves are long and tight and the neckline high, which again is typical. And, at the front, a draped ‘apron’ with fringing is caught up at the side with a row of bows. 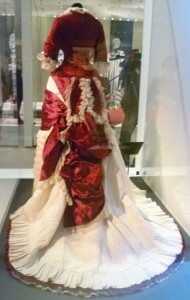 At the time, trimming was immensely fashionable: flounces, bows, fringes, pleats, ruching, etc., not to mention feathers, lace, and broderie anglaise. 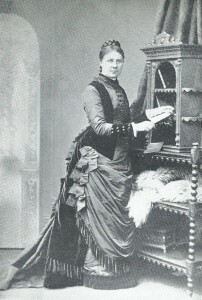 In our example, the bottom of the skirt is also fringed; there is a frill round the neck and down the bodice, and four pairs of bright buttons down the cuff. Seventy or eighty yards of trimming might be used on a skirt alone. In ball dresses, even the trimmings themselves were trimmed with tinsel, spangles and beads. So, why was the red dress so shocking? First of all, its colour. The fashion at the time was for muted colours for daytime: ‘sickly pink and sulky blue’, says one fashion magazine. Or one might go for two different shades of grey, say. But our dress is not just red, it’s scarlet and, furthermore, it’s matched with white, a colour which was usually reserved for petticoats – certainly in a day dress.. Shades of a scarlet women, perhaps. Then, the neckline is scandalously low for a day dress. Of course, there were a variety of day-dresses: walking dresses, morning-dresses (the most informal), afternoon dresses for paying calls, etc. This one is obviously for something a bit special – a preview at the Royal Academy Summer Exhibition, perhaps. It plunges in a U right down to the bust, its shape emphasized by the creamy frill. Décolleté necklines and prettily rounded sloping shoulders were much admired in an evening dress, but not in a day-dress. And there are three-quarter length sleeves, which are not particularly tight. Could this indicate a looseness of morals? And there’s worse to come. 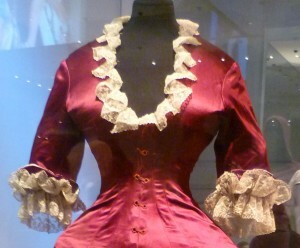 If you look closely at the bodice, you will see that it looks as though it has corset lacing at the front. 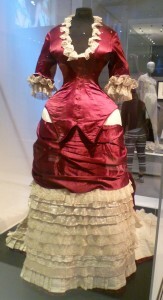 In other words, what really shocked the dress’s contemporaries was that it looked as though the corset, instead of being hidden and underneath, was now showing and on the outside. And the dozens of white lace flounces in the skirt could almost have come from a petticoat! The wearer would have worn several petticoats, the top one of which would have been as lacy as the wearer could afford. The ‘apron’ which you can see decorously attached in the black and white photo looks almost loose on the red dress, as if there’s nothing holding it up. One shake, and it might slither to the ground. Already the white ‘petticoat-like’ skirt is showing around the hips. And, in many respects, the dress is shockingly plain! Yes, the white skirt is made up of layers of lace, but there are none of the bows, fringes and buttons in the respectable black and white photo. Who owned this dress? When did she wear it? And what happened? Because, surely something did. There must be a story there and I’d love to know more about it. Undressed: a brief history of underwear is on at the Victoria & Albert Museum until 12 March, 2017. Highly recommended. I love the dress Elizabeth – particularly the back. It’s utterly wonderful. But how uncomfortable it must have been wearing such restrictive undergarments. Thinking about how hot it has been in London during the past few days, wearing something like this in the summer must have been torment. I couldn’t agree more, Janet. Apart from anything else, you would have to put on your stockings and shoes first, before you put on the corset, because, after that, you couldn’t really bend – except at the knees! No wonder they all sat up so straight. Well it’s seriously ugly. But at first glance, it does indeed look as if the lady has lost her skirt and the petticoat is all that stands between her and total immodesty. the woman who wore that was making a statement in no uncertain terms. You must be right, Jenny – I enjoyed your emphatic tone! The question is, though, exactly what statement is she making? Thank you for dropping by, Jan. I was thinking of the Sherlock Holmes’ stories when pondering on a title. A number of them are called: ‘The Case of the…’ and, of course, there’s ‘A Study in Scarlet.’ I wanted something which sounded of the period. What an amazing dress! But that corset is the work of the devil. It’s horrifying. I absolutely agree with you, Margaret – and how nice to hear from you – that corset is horrific. It probably set back the cause of women getting the vote, too! Who could possibly go on a protest march whilst wearing a cuirass corset? I have to laugh, Elizabeth, because women began their real fight for sufferage in the most unnaturally-shaped corset in the 19th c. While the bust was relatively free, the waist was at its tightest, and the straight front of the 1890’s corset threw the hips back in a very unnatural line. Maybe that’s what riled them up! Thank you for your comment, Meg. I’m sure there’s a whole psychological dimension to corsetry, especially in the 19th century, because, you are right; it does seem odd that rigid corsets emerge at more or less the same time as the Women’s Suffrage movement. And women like Barbara Bodichon were anything but rigid in their thinking! Corsets are not that restrictive! You seem to damn them alot. I wear mine regularly, before putting on socks and i ride my horse in it! Anyone wanting to learn about how victorian garments were worn and what it was like to wear them should look up modern makers of period clothing as they still wear them and are employed to do so at events because they are accurate. I can see that a well-cut modern corset could help enormously with supporting the back whilst riding. I understand that you ride side saddle; in which case, I’m sure you look superb in yours! I do admire the subversive dressmaker! Society was determined that the corset should function as a form of chastity belt, keeping the wearer’s thoughts focused on submissive docility; however the wearer of this scarlet confection would be entering the Madonna ‘underwear as outerwear’ zone – brava! It wouldn’t be my style, but I do hope that she wore it of her own free will – and that she enjoyed wearing it. I wish we could know the true story. Thank you for dropping in, Prem. I’m delighted you enjoyed the post. I don’t know who owned the scarlet dress, alas. But the owner’s story would make a terrific novel! Perhaps some of my writing friends are mulling over the possibilities at this very moment!